Latest in Local News in the community of Galloway Township and News within the surrounding area. All Rights Reserved. BUENA BOROUGH — A special law enforcement officer of the Buena Borough Police Department was arrested this morning for official misconduct and child sexual assault, Acting Atlantic County Prosecutor Jim McClain announced. 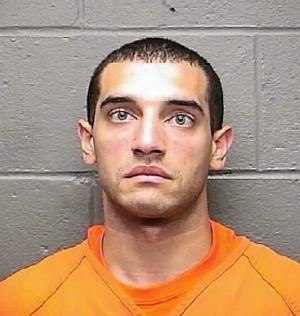 An investigation of the Atlantic County Prosecutor’s Office Special Victims Unit resulted in the arrest Friday, June 27, 2014, of Buena Borough Special Officer Sean R. Griffith, 24, of the 300 block of South Franklin Street, Landisville, NJ. Griffith was arrested without incident in Buena Borough, and charged with three (3) indictable offenses: Official Misconduct—a 2nd degree crime, Sexual Assault—a 2nd degree crime, and Endangering the Welfare of a Child—a 3rd degree crime. The state alleges that Griffith committed the acts while holding a position of authority and disciplinary power over a 17 year-old female victim. Griffith was lodged in the Atlantic County Justice Facility in lieu of $100,000 cash or bond bail, set by Atlantic County Superior Court Judge Mark H. Sandson. He is scheduled to be arraigned on the charges in Buena Borough Municipal Court on July 10, 2014 at 1:00 p.m.
A crime of the 2nd degree carries a potential sentence of 5 to 10 years of incarceration in New Jersey State prison. A 3rd degree carries a potential penalty of 3-5 years imprisonment. Anyone with information about the case is asked to contact the Atlantic County Prosecutor’s Office Special Victims Unit at (609)-909-7972. Anyone with information involving serious crimes is asked to call the Atlantic County Prosecutor’s Office at 609-909-7800 or go to the Prosecutor’s Office Web site at http://www.acpo.org/tips.html and provide information by filling out the form anonymously on the Submit a Tip page. People can also call Crime Stoppers at 609-652-1234 or 1-800-658-8477 (TIPS) or visit the Crime Stoppers Website at http://www.crimestoppersatlantic.com/. Crime Stoppers offers cash rewards for information leading to the arrest and indictment of those who commit crimes in Atlantic County. Copyright (C) 2011-2017 Galloway Township News.